April | 2016 | Real Art Is Better! Shepard Fairey is a street artist, graphic designer, and legendary political artist who is most famous for his iconic Obama Hope poster. 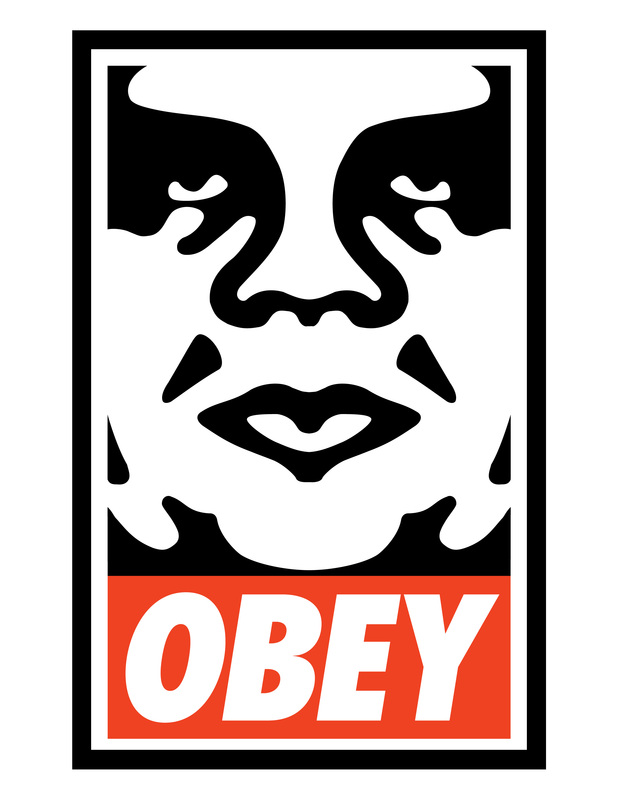 He is also well known for a piece of Andre the Giant with the text “Obey”. His newest famous piece is an eight-story-tall image of Nelson Mandela. I painted this beer parody of the Obama Hope poster not to show my affiliation with the Democratic Party, but to poke fun at the fact that, as beer lovers, we are all hoping for a beautiful pint in our future. I am also hoping Shepard Fairey does not send me a “cease and desist” letter like he ironically did to an artist named Baxter Orr who used his image of Andre the Giant to create a poster that said “Protect” with a SARS mask over Andre’s face. Fairey called Orr a parasite. Turns out that Fairey himself had been using others’ art to create his pieces in the first place. This landed him in a load of trouble for using Mannie Garcia’s Associate Press image of Obama to make his Hope poster. He ended up paying $25,000 in fines and had to do 300 hours of community service. It’s a good thing parodies are protected under the fair use freedom of trademark laws in the US, or I might be in the same boat. Raise your pints and hope for a beer, not a lawsuit! The original oil painting sold, but I released 52 limited-edition prints. You can purchase prints, or order a custom beer painting at my Etsy shop RealArtIsBetter. Thirsty Thursday Beer Painting #69 by Scott Clendaniel. Inspired by Shepard Fairey. April 21, 2016. 14″x11″, oil on panel. This entry was posted in Thirsty Thursday Series and tagged beer art for a bar, beer pint poster, Gift for a democrat, gift for beer drinker, Gift for Boyfriend, gift for brother, Gift for Husband, Obama hope poster, shepard fairey on April 21, 2016 by realartisbetter. A few months ago I wrote a blog post about sources of income from our art business, and today I’m going to let you know how much we spend to keep the business going. Here’s a list of our business expenses from the last 30 days. One of the major reasons we are able to live off of our income from the art business is because we try to keep our overhead low. This last month was more expensive than normal due to taxes, several sticker orders, and stocking up on supplies before the summer rush. Hopefully next month we’ll manage to keep our costs down. This entry was posted in The Business of Being an Artist and tagged how to run an art business, the business of being an artist, Working as an artist full time on April 19, 2016 by realartisbetter. Pierre-Auguste Renoir (1841-1919) painted the Luncheon of the Boating Party in 1880-81, when he was 40 years old. It is a large canvas, 51 x 68 inches. My beer-infused version is only 11 x 14 inches, but I feel it still captures the essence of the original composition. I call this piece the Tasting of the Beer Party! The guests are sampling some sought-after beers: Spotted Cow, Heady Topper, Pliny the Elder, The Abyss, Bourbon County Stout, and 120 Minute IPA. I have always enjoyed Renoir’s paintings. When I was 12 years old my grandmother gave me a picture book of his paintings and I have always worked to be as proficient a painter as Renoir, setting quite a high standard for myself. You can always recognize a Renoir painting, because it is the ideal Impressionist work incorporating the human figure. Monet painted in a very similar style, but rarely depicted as many people. It is also very inspirational to see a painter who was not only successful, but painted party scenes for a long full life. Renoir was nearly 80 years old when he passed. He was lucky enough to walk through the Louvre in 1919 and see his paintings hanging on the same walls as ones of the old masters! I hope you enjoy this parody of one of the best paintings of art history, and we should all hope we all live as long and full lives as Pierre-Auguste Renoir! The original oil painting sold, but I released 52 limited-edition prints. You can purchase prints, or order a custom original oil painting at my Etsy shop RealArtIsBetter. Thirsty Thursday Beer Painting #68 by Scott Clendaniel. Inspired by Pierre-Auguste Renoir. April 14, 2016. Tasting of the Beer Party. 14″x11″, oil on panel. This entry was posted in Thirsty Thursday Series and tagged 120 minute IPA, beer painting, Bourbon County Stout, dining room painting, food painting, Gift for Brewer, Gift for Husband, heady topper, Luncheon of the Boating Party, Pliny the Elder, Renoir, spotted cow, The Abyss on April 14, 2016 by realartisbetter. Happy Thirsty Thursday on National Beer Day! And, today is also my birthday! April 7 was a great day in 1933 when beer became legal again after 13 years. Home brewing didn’t become legal until 1978, which is ironic, because home brewing is essentially the way beer was invented some 7,000 years ago. This week’s Thirsty Thursday beer painting is a parody of Katsushika Hokusai’s The Great Wave off Kanagawa. This was the first of 36 paintings of Mt. Fuji that Hokusai produced from 1830-1833. In my version I portrayed the boats as glasses of pilsner floating in a wave of dark beer I presume to be porter, or stout. This wave of beer reminds me of a carboy incident I had while home brewing back in 2006. Little to say, I have new bamboo flooring on the living room side of my kitchen counter as a result. I call my version of this painting The Great Beer Wave. I hope you spend National Beer Day home brewing, or at least pause from your busy schedule for a needed beer break! In celebration of National Beer Day coinciding with Thirsty Thursday and my birthday I’m having a 15% sale at my Etsy shop RealArtIsBetter. Use coupon code BEER2016. Valid today only! The original oil painting sold. You can purchase limited-edition prints, or order a custom beer painting at my Etsy shop RealArtIsBetter. Thirsty Thursday Beer Painting #67 by Scott Clendaniel. April 7, 2016. The Great Beer Wave. 14″x11″, oil on panel. This entry was posted in Thirsty Thursday Series and tagged bar beer wall art, beer gift, beer painting, dining room painting, Famous paintings with beer, food painting, Gift for Boyfriend, Gift for Brewer, gift for brother, Gift for Husband, Hokusai’s The Great Wave, japanese wave painting, kitchen wall art on April 7, 2016 by realartisbetter. What Does an Artist’s Business Manager Do? Learn about running an art business through blogs, podcasts, books, etc. This is not a complete list, but should be enough to give people an idea of what I do. There is no way one person can make art, and tackle the business end, which explains the “starving artist” myth. Most creative souls just want to create, but not all are lucky to have business-minded individuals taking care of the business end. I love my job, and am glad I finally let Scott talk me into being his Business Manager! This entry was posted in The Business of Being an Artist and tagged how to make a living as an artist, working as an artist on April 5, 2016 by realartisbetter.